Alt Text: "I didn't even realize they MADE a novelization of "Surf Ninjas." How did you-- Oh my god, it's signed by the author?!" Last edited by gmalivuk on Mon Jun 11, 2018 2:13 pm UTC, edited 3 times in total. And now the Thomas the Tank Engine theme tune is stuck in my head. I think it's just the quotes round the comic title that are missing now. I didn't notice the link to the New Yorker article the first time I saw the strip, though I had heard the theory about Thomas the Tank Engine previously. It's a good rabbit hole. I wonder if Randall has actually read it? Maybe it's another trip-fest like the Back to the Future novelization, which diverged so far from the movie that Ryan North wound up writing an eBook about it. Surf Ninjas was narrated by the Police Chief from Jaws? There's an epic battle scene in there somewhere, isn't there? Tanada ninja clan on surf-boards versus Megalodon. Neither Pinterest nor Google book cover image search turned up that picture. A possible guess is Eragon by Christopher Paolini at 503 pages. Or maybe Randall's just trolling us. I have a feeling that at least three more of the Clancy books (paperback!) I have stored elsewhere are going to have nearer-unity thickness to width than any of the ones above, plus perhaps one or two of my reference books there. Maybe a Lord Of The Rings compilation 'lazily' put together largely from the originally separate volume imprints into one single bound copy might be close to the practical manufacturing/handling, limit (for near-terminal stress upon the binding sleeve) and there are ultra-small "Little Book Of <Foo>"s that seem to be made cubic (or nearly so) in bound format, but mostly because they're below A7 in head-on footprint and aren't actually that thick to handle (though must be a pain to machine-bind!). "Clash Of Kings" only has a crown on its cover (one or more of its siblings may have dragon and/or sword). 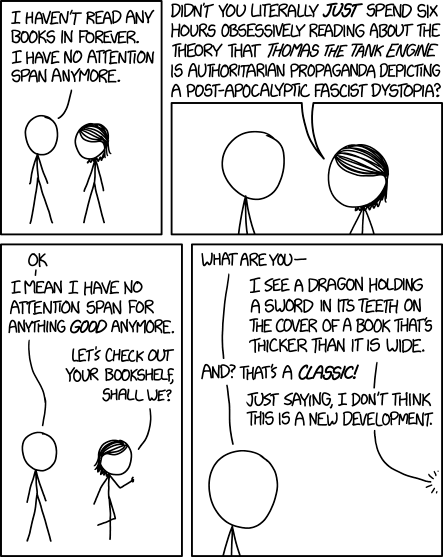 I have a number of books depicting dragons and/or swords (Guards! Guards! with its Josh Kirby cover is the obvious one, with a sword held very close to a dragon's flaming mouth) but they're not notably thick, except for this Harry Potter And The Goblet Of Fire (twice as thick as any of the prior three, and has a dragon on the front in this series of the covers - which either did not continue or sold out, as I never bothered buying further in the series and mis-matching the covers just for the hum-drum derivative tale that I'd only started reading because I was told it was worthwhile). The very old badgered (maybe or maybe not dragonned) copy of The Hobbit would be my best guess off the top of my head of all those I could claim to possess, but is in the other location right now so I can't check. Besides which, post-Tolkein (and -Conan, etc) derivative fantasy literature is probably the main culprit you might bring to mind, and I've got relatively little in that line, myself, though I may well have borrowed just such a book from the library back in the '70s or '80s. The caste system is very rigid. There is one diesel engine, a black train known just as “Diesel,” who struggles to prove that he’s as useful as the steam trains. Less useful than Diesel are the female passenger coaches named Annie and Clarabel, who are awarded to Thomas as prizes after he helps with a train breakdown. "Thomas, if you spend all your time worrying about silly things like freedom and equality, you'll never be REALLY useful!" A book thicker than it is wide is simply impractical, is it not? One would struggle to read it without a special stand. It would be something people would publish with the expectation that no one would actually read it. I might suggest the Death Gate Cycle, but as far as I can tell it has never been published in a single volume. The Great Book of Amber also springs to mind, but dragons do not feature at all in that series, and it is far from being thicker than it is wide. Also, for a less-dark take on Thomas the Tank Engine, may I suggest Trains Formers? In fairness, black is the standard colour for diesel, at least at filling stations in the UK. And in the latest movie they introduced a genderfluid character and another who was on the spectrum. I'm not at home so I can't actually measure but I'm thinking my paperback of Les Mis might get the closest. That thing is a brick. Or maybe Battlefield Earth, which is similarly brick shaped. I have managed to plow my way through Les Mis (by purposely only taking that one book on vacation, pre-ereader), haven't managed to make it through Battlefield Earth. I have a feeling that at least three more of the Clancy books (paperback!) I have stored elsewhere are going to have nearer-unity thickness to width than any of the ones above, plus perhaps one or two of my reference books there. A lot of Peter F Hamilton paperbacks beat those. My copy of Judas Unchained is 55mm x 110mm x 177mm, or 0.5 times thick as it is wide. They're definitely thicker than any of my Clancy paperbacks. Sunidesus wrote: I'm not at home so I can't actually measure but I'm thinking my paperback of Les Mis might get the closest. That thing is a brick. Or maybe Battlefield Earth, which is similarly brick shaped. Sunidesus wrote: .... haven't managed to make it through Battlefield Earth. You say that as if you're thinking "And someday I really should." If it helps you decide, wherever you are in the book, the rest is pretty much just like that. Yeah, that wasn't great wording on my part. The only possible way I would try that thing again is out of some sick fascination. More of an "it can't really be as bad as I remember can it?" kind of thing. It's currently in the category of "books I know I should get rid of to give myself more shelf space", I just have a *really* hard time getting rid of books. Which would be why my bedroom walls are nearly all bookshelves. I have a physical Battlefield Earth (unless I've managed to dispose of it at some point), but only a virtual Les Mis - and have completed both more than once. Battlefied Earth sticks in my mind for its aggressive ignorance of mathematics - it's a key plot point that a) base ten arithmetic is intrinsically superior to all other number systems, to the point that its inventor is invariably celebrated (just like they are on Earth?) and b) base eleven arithmetic is so obtuse that the entire combined mathematical minds of the galaxy have been unable to decipher it. The tank cunningly shaped so that a shell coming from any angle will come in at a glancing angle rather than hitting straight on is just an afterthought. I read BE (well before the film, and before I knew of Hubbard's whole other 'thing') as a loan from the library¹. I think that each of the Mission Earth books (decalogy) were similarly lengthy. And even less likely to be made into a Hollywood film. Without loads of edits and abridgement. I read a lot of rubbish, back then. Pre-web (and, for me if not for DARPA et al, pre-Internet). That's changed now, of course. I'd tell you more, but I've just going to Google @realDonaldTrump to see how much fresh banging of my head against the desk I shall need to do tonight. ¹ L Ron's stuff was tame (in perversity) compared to some of the stock, when I think back. ² Anathem is a thick book! Not true, though - what about BoCo, Mavis and Daisy? They're all diesel engines, who might sometimes start out a bit stuck up in some cases but end up friends of the other engines. ... and Ringo's part in this scheme is? RogueCynic wrote: ... and Ringo's part in this scheme is? Not entirely sure about the rest of that New Yorker article, but I can say that it's being blatantly dishonest about Henry. 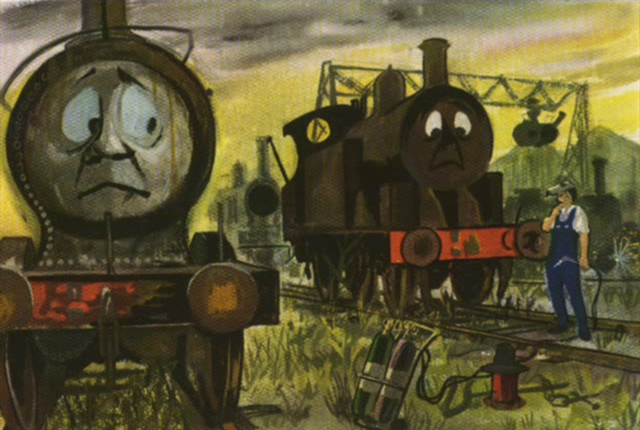 The episode where he is walled up is only a smaller part of a larger story arc that finishes with Henry To The Rescue, where they restart his boiler, put his tracks back and he redeems himself and saves the day. But the article fails to mention that, talking darkly about train "death sentences" and other such. That kind of dishonesty in writing makes me suspect the rest of anything that is written by that author, as it degrades his credibility significantly. This is Henry to the Rescue, the follow up to the episode mentioned prior. Soupspoon wrote: Anathem is a thick book! I was going to list another Stephenson book that may fit the "thicker than it is wide" criteria: Cryptonomicon. That book is a beast. I'll check if I still have it when I'm at home. I may not have it anymore though, I eventually lost interest in all of the characters somewhere around half-way though. If I don't care about the characters, I have a hard time caring about the plot. Last edited by Lode on Wed Jun 13, 2018 10:48 am UTC, edited 1 time in total. I have it! Should have it. Somewhere. Not sure where. I think I know what you mean about the characters (across both eras, with co-dynastic coincidences abounding. Though I obviously held on better than you indicate. Some interesting touches along the way helped, such as the bit with Turing. And the the ad-hoc 'anti-snooping' protocol developed to defeat the attempts to use equally technologically outrageous methods of bugging on that laptop. I feel like Stephenson style is best applied to story-lines that take place in the future. I loved both Snowcrash and Diamond Age (Diamond Age especially), but have a hard time with any of his "historical fiction." Maybe it's a suspension of disbelief thing, or that I feel that his sci-fi world building (of which I love) works out better when it does not have a concrete historical structure he must work around. Then there's Stephenson syndrome, where all of the storyline threads tie together, ramping up to what appears to be a crescendo, a high point, then...it walks into the sea. I like that in this comic, the phrase "just saying" is followed by an actual statement. Although it makes me a bit meta-sad that this makes me happy, sort of like when I see "as far as" and there actually is an "is concerned" or at least "goes" at the end of the sentence. I have the same attention span problem. And I think I've been afflicted by it since I was 17, though it only became obvious as a problem when I found I couldn't finish books any more ten years ago. Went to a psychologist to get it fixed, and she told me I was so out of shape reading exhausted me. Told me to get some exercise. She didn't tell me which exercise though, so I had to do some testing. Turned out 30 minutes a day of 60-70% of maximum pulse rate for three months fixes it. Though you'll want more if you don't want to slip right back in. By the way, that will also fix suicidal urges, but don't ask how I know that, lol. Edit: By the way, consistent exercise is better than variable. So get an exercise bike if you can. Last edited by tibfulv on Tue Jun 12, 2018 6:34 pm UTC, edited 1 time in total. GlassHouses wrote: I like that in this comic, the phrase "just saying" is followed by an actual statement. The reason being, is that language is changing. IMHO, "the reason being" is pointless anyway: I'm not sure there's any situation where replacing it with "because" (and adjusting the punctuation accordingly) doesn't improve the sentence in every way. "As far as <X> is concerned" is a useful construction: it allows us to qualify a statement as applying only within the limited scope of <X>. This is usefully different to "regarding" or "concerning", which just indicate the topic without restricting the scope in the same way. But the syntax is unfortunate in that it's liable to create centre-embedded constructions, which are cognitively taxing. A proficient listener will know the "... is concerned" is coming and can disregard it, but it's still an encumbrance. Unless <X> is a very short Noun Phrase, the temptation to omit the closing words and make life easier for both parties is going to be hard to resist. And the result isn't actually that bad: unlike "the reason being is", it's ok grammatically and it kind of makes sense. I never encounter that "the reason being is" construction, and I really don't see why anyone would use it when they could just leave the "is" out and have something grammatically correct and shorter. E.g. "Unlike most people around here, Alice goes shopping every single day, the reason being that she doesn't have a car and so can only carry one small bag of groceries per trip." It's true that you could just substitute "because" for "the reason being that", but I don't see why anyone would ever put an "is" in there, and I don't think I ever really see that done either. Indeed. In my experience, it's more a spoken thing than something you see in writing, and may well be a peculiarly British affliction. It's the kind of pompous verbosity that people come out with to try to sound formal and educated, but has the reverse effect when they get it wrong. I get the impression that people parse "the reason being" as a phrase (a NP?) meaning "the reason that pertains", a bit like "the powers that be". The phrase "the time being" might also be an influence. People are so used to seeing "be" and its various forms turning up in apparently nonsensical or ungrammatical constructions (fossilised subjunctives and whatnot) that they're probably less likely to question it in this case than they would for a more ordinary, regular verb. Sandor wrote: A lot of Peter F Hamilton paperbacks beat those. My copy of Judas Unchained is 55mm x 110mm x 177mm, or 0.5 times thick as it is wide. They're definitely thicker than any of my Clancy paperbacks. Handbook of chemistry & Physics (CRC) 29th edition (1945) 73mm x 123mm x 170mm, .59 times thick as it is wide. And I think I'll make a cover for it with a gun toting dragon on it. Pfhorrest wrote: I never encounter that "the reason being is" construction, and I really don't see why anyone would use it when they could just leave the "is" out and have something grammatically correct and shorter. E.g. "Unlike most people around here, Alice goes shopping every single day, the reason being that she doesn't have a car and so can only carry one small bag of groceries per trip." It's true that you could just substitute "because" for "the reason being that", but I don't see why anyone would ever put an "is" in there, and I don't think I ever really see that done either. Does one need the "that" here? My wife and I have this disagreement about 'that' often. She's gone so far as to pull articles from magazines, cross out the extraneous ones, and mail the article to the author/publisher/editor. We do both agree about "where we're/you're at", though. "That" is mostly a matter of style. Some omit it as unnecessary, I prefer to retain it for clarity but see no grammatical problem with omitting it. Every time a circumstance arises for an inclusion of "that", I spens several minutes contemplating whether to omit it or not.